Homo sapiens experience change throughout our lives, but when it comes to changes on the scale of our civilization or environment, we have the perspective of walking along the Earth’s surface, unaware of its curvature. Because our memories are recreations of events, rather than a recording, we experience landscape amnesia, recalling events from the past in the environment surrounding us today rather than the way it looked then. Science tracks the long-term changes our short lifetimes cannot comprehend. Although Global Warming occurs at pace of such tiny increments, we cannot perceive the increase in temperature from year to year, science catalogues and documents such change. 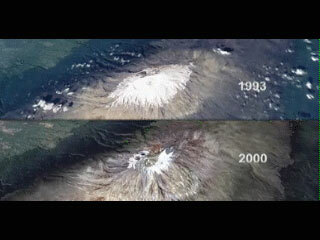 When the snows of Kilimanjaro vanish, science overcomes our brains’ tendency to forget this feature was ever there. Our brains have evolved to perceive the world one way. Science equips our minds to perceive it a more accurate way. We must embrace these cognitive advances that have rendered our innate biological state obsolete, lest we become irrelevant along with them. And evolution’s method for dealing with irrelevance is extinction.